You can apply online via the DVLA website or complete a D1 paper application form, which is available at your local Post Office or from the DVLA Form Ordering Service. Your Provisional Licence should arrive within three weeks. Below is a helpful video from the DVLA showing you how to complete your D1 application form. The Theory Test consists of two parts. Part one is multiple choice and part two is a Hazard Perception Test (HPT). You must pass BOTH parts of the test before booking a practical driving test. Below is a short video from the DVSA and it gives you all the information you need about the Theory Test. The multiple choice test involves answering 50 questions on a touch screen monitor. You have 57 minutes to complete it and the pass mark is 43 out of 50. The HPT comprises of watching 14 video clips of everyday road scenes. Each scene will have at least one developing hazard and one scene will have two developing hazards. You must identify the developing hazard by clicking the mouse and the earlier you identify the hazard the higher the score you will gain. The pass mark is 44 out of 75. The theory test costs £23. You can book a theory test and also find your nearest theory test centre on the DVSA website. 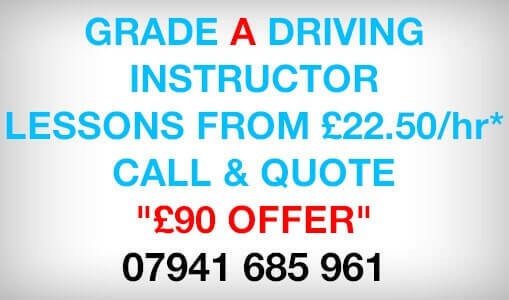 1st Gear Driving School Watford will help you prepare for the driving test during your driving lessons. From the 4th December 2017 the practical driving test changed. The changes are designed to make sure new drivers have the skills they need to help them through a lifetime of safe driving. The practical driving test lasts approximately 40 minutes and will be conducted by a qualified driving examiner. Please remember that the examiner is there to ensure that you have developed the right skills and are a safe and careful driver. They are not looking to catch you out or look for reasons to fail you. Your driving skills will be assessed, along with one reversing exercise and possibly the emergency stop. You will need to demonstrate to the examiner that you can drive safely and that you have knowledge of the Highway Code. 1st Gear Driving School will collect you one hour before your driving test so you can have a practice and settle into the car. Your driving test will begin with an eyesight check. You will be required to read an old style number plate from a distance of 20.5 metres and a new style number plate from a distance of 20 metres. You will be asked two vehicle safety questions – also known as the ‘show me / tell me’ safety questions. The ‘tell me’ question (where you’ll be asked to explain how you’d carry out a safety task) will be asked at the start of the driving test and before you start driving. The examiner will ask the ‘show me’ question (where you will be asked to show how you’d carry out a safety task) whilst you’re driving. For example, you might be asked to wash the windscreen using the car controls and wipers. You can find the full set of ‘show me, tell me’ questions on the DVSA website and 1st Gear Driving School will go through these on your driving lessons leading up to your driving test. For approximately 20 minutes of the driving test you will be required to drive independently either by following road signs to a specified destination or by following a sat nav. You should listen to all the instructions the examiner and the sat nav give and ask questions if you are unsure where you have been asked to drive. 4 in 5 practical driving tests will follow a sat nav. If you go the wrong way, it doesn’t matter, as long as you don’t make a mistake while doing it. Park in a bay – either driving in and reversing out, or reversing in and driving out. Pull up on the right-hand side of the road, reverse about 2 car lengths and then rejoin the traffic. 1st Gear Driving School will still teach you how to turn in the road and reverse around a corner because these are essential skills you will use at some point whilst driving. You should be prepared for the examiner to make notes throughout the test. Do not be put off by this, they are making notes of your driving. You are allowed up to 15 minor faults and still pass the practical test. If you make 16 minor faults or more, or a fault that is considered dangerous/serious, then the examiner is obliged to fail you on that occasion. The practical driving test costs £62 on weekdays, or £75 at weekends or in the evening. You can book your driving test online via the DVSA website. 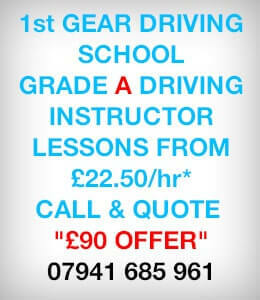 1st Gear Driving School provides driving tuition in the Watford area. We have taught 100's of pupils since 2002 and have a high pass rate to be proud of 100% (21st Sept 2018 to 1st April 2019). We also provide driving tuition in the surrounding areas of Watford, such as Abbots Langley, Northwood and Rickmasworth. For more information have a look at our Teaching Area page. We cater for nervous and inexperienced pupils and our teaching style is adapted accordingly. 1st Gear Driving School can also teaches Pass Plus and refresher courses. Our driving instructors are highly trained and experienced, and members of the DIA, Approved Driving Instructors of the DVSA (Grade A - May 2018) and Pass Plus registered.